Overall appearance of the Super Citrus color morph is elegant and well balanced. The look of the Super Citrus is streamlined, lean and racy as a younger adult but never "thin." The Super Citrus dragon becomes more powerfully built as an older adult of 2 - 3 years but maintains grace of movement and regal demeanor. The highest quality Super Citrus is never blocky in appearance. The head, neck, body, arms, legs and tail should be structurally proportioned. 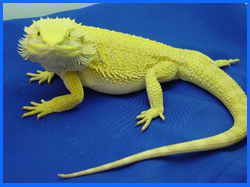 Super Citrus dragons are a bright lemon yellow, with narrow light lavender side bars. The highest quality specimens have a luminous quality with undertones leaning toward green in the color spectrum. The Super Citrus displays a regal, intelligent, alert disposition. Wariness in a new environment is normal and a sign of good health. Triangular. Top line eye ridges present but not overly pronounced. Copper golden brown to brown. Round. Fault: visible gaps between eye and lower lid causing a drooping appearance. Upper and lower lip lines should meet without gaps. The following ranges apply to adult Super Citrus dragons over 1year of age. Ranges were established by measuring a cross-section of the colony; 20 adult Super Citrus dragons, 10 males and 10 females, between 1 and 4 years of age. Overall length is measured from the tip of the nose to the tip of the tail. Overall length and weight ranges are directly related to the dragons' age. Super Citrus dragons should be active in movement with no pronounced jerking, which can be indicative of MBD. 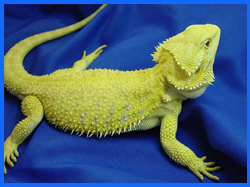 Super Citrus dragons are a bright lemon yellow, with undertones leaning to green in the color spectrum. Super Citrus have light lavender side bars. In the most beautiful specimens the bands are narrow. Nails can be clear or semi-clear but not dark or black. While hatchlings and juveniles may have some pattern, by 1 year of age, only a slight ghost pattern is visible or no pattern at all. Hatchlings and juvies may show slight orange to extreme orange and sometimes red, but the best specimins will shed into clear Super Citrus yellow with the lavender side bars as the dragons mature to 1 year. The highest quality specimens retain no red and minimal orange scales. Slight orange shading around ears, eyes or sides of throat is acceptable. The most excellent Super Citrus specimens should be full body lemon yellow, from nose tip through head, down neck, back, sides, spikes, tail, legs, feet and toes. White scaling may appear in feet and toes. Undersides are pure white. Throats can be Citrus yellow. Head scales or spikes that "gray out" to the tip are acceptable, especially in older dragons. Any color other than lemon yellow. Wide saddles or side bars. Contrasting dark or intrusive pattern in adults over 1 year of age. More than 1% orange skin or scales. Bulging eyes. Weight or length beyond acceptable ranges. Viciousness or extreme shyness can be considered a fault, depending on the severity of the trait. Copyright of Terri Sommella, Fire and Ice Dragons 2003. All rights reserved. No part of this Standard may be used, in full or in part without express written permission. There are no exceptions.